"Best friends in childhood, Jane's and Thomas's relationship blooms beyond friendship as they grow into adults. When Thomas is reportedly killed in the American colonies, Alexander, Duke of Gordon, appeals to a devastated Jane. Believing Thomas is gone forever, Jane hesitantly responds to the Duke, whose passion ignites her blood. But Thomas is not dead, and when he returns to find Jane betrothed to another, he refuses to accept the heartbreaking turn of events. Soon Jane's marriage is swept into a turbulent dance of tender wooing and clashing wills--as Alex seeks to make her his and his alone. Winner of the "Romantic Times" award for Best Fictionalized Biography. But Thomas Fraser is not dead, and when he returns to find his beloved Jane betrothed to another, he refuses to accept the heartbreaking turn of events. Soon Jane's marriage is swept into a turbulent dance of tender wooing and clashing wills--as Alex seeks truly to make her his, and his alone. . . ."
This is such a wonderful piece of historical fiction that Sourcebooks Landmark publishers picked it up after twenty years and decided to republish it. And I am so glad that they did, because this is a story that needs to be told, but hasn't been. Based on a true story, Jane Maxwell is an infectiously delightful young lady who soon grows up to be a rival the Georgiana the Duchess of Devonshire. But how she got that way is the charm of the story. Set against the backdrop of Scotland, Ciji Ware brings Jane Maxwell to life in this endearing tale of love, passion and betrayal. Jane Maxwell has an overbearing mother but enjoys her childhood with her sisters and the neighborhood boy, Thomas Fraser. As they grow up together, Thomas and Jane become more than friends, much to the chagrin of the status-seeking mother of Jane. Thomas leaves Scotland in spite of Jane's pleas to stay or to at least marry her before he leaves, but he is intent on restoring his family name by becoming a good soldier in the States. He leaves Jane behind, and she is heartbroken that his tunnel vision does not include the predicament that he left Jane in. With Thomas Fraser gone for two years, Jane's mother worked furiously to eradicate him from Jane's memory. A battle in the states went so bad with Indians that the soldiers could not distinguish who the bodies belonged to. Thomas was among those assumed dead. When Jane received word of this, she was stricken and paralyzed with grief. This was a superbly written part in the story that had me crying my eyes out, even though the back cover of the book foretold this event within the plot. At the same time, the Duke of Gordon has lost the mother to his child, and he recognizes Jane's pain. He is a complete gentleman and makes the reader really enjoy his presence within the story, for he really seemed to be a diamond in the rough. And he was a DUKE! That was the most important thing to Jane's mother, even though Jane had no intentions of furthering the relationship beyond companionship. Eventually though, the Duke grew impatient, and in very much love with the beautiful Jane Maxwell. He was determined to rid her of her ghost of Thomas Fraser and to make her his wife. A turning point in the novel occurs when he coerces Jane into marrying him. And she is happy.. she thinks... till she finds out that Thomas is indeed alive and well, and this not until her honeymoon!! The tragedy of these two love birds was perceptible and heartbreaking, especially as they meet for one last goodbye at the island of the swans. Can the Duke of Gordon make Jane forget Thomas Fraser? Can the Duke of Gordon handle being second fiddle to the ghost who came alive? Will their marriage work in the end? We fast forward and there are a brood of children to the Duke and Duchess of Gordon, and they appear happy. But the emotions of knowing that Thomas Fraser is alive wears both of them thin. The Duke is not quite as empathetic as he was before, because Jane is officially his wife and he has no desire to compete with a low born soldier. I felt my attitude of the even-tempered Duke become more and more exasperated with his masculine insecurities. And yet at the same time, our heroine Jane carries on, and continues to bear children for the Duke. She very much wanted the marriage to work and enjoyed her Duchess status. She was an enigmatic character who enjoyed the social scene, traveling to London from the Gordon's Edinburgh home, and she seemingly tried very hard to keep Thomas Fraser out of her heart. 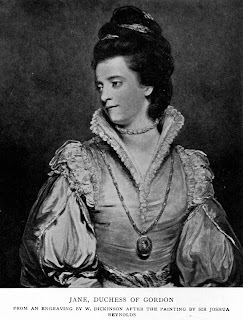 She is said to have been the Duchess of Devonshire's rival. Unfortunately, Thomas showed up at inopportune times, causing major rifts in the marriage between Jane and Alex Gordon. I really loved the way that Ciji Ware spun this epic saga, taking little known details of this love triangle and making their long-gone stories come alive again through this plausible telling. 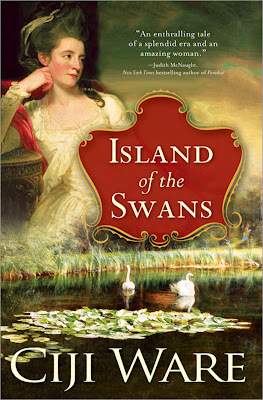 Ciji Ware infuses the novel with historical details so that when the romance scenes take over, the historical aspect of the rest of the story more than made up for the steamy romance scenes. And yet, even though I am not a romance genre connoisseur, I loved the entire aura of the novel, coupled with the romance and the history. Of course the author had to infuse her interpretation of the facts to thicken out the novel, and one can only wonder if Alex was as sensitive as he seemed to be in this telling. But it is certainly true that he had a roving eye, and enjoyed bedding his servant. A fantastic setting, and wonderful writing supported the slow moving drama of Jane Maxwell's life, and I felt like Jane would have been proud to have this story written for her. There are not many Jane Maxwell novels out there, and even if there were, this would still be the one that is highly acclaimed. Take this as a warning: it instills a melancholy within your soul, knowing that true love never dies regardless of the circumstances of one's life and the need to move on. The overwhelming feeling of sadness was palpable throughout the saga and I did weep several times. I am becoming such a softie it seems. This was a mesmerizing blend of sizzling romance, history, love and honor that I recommend to any historical fiction enthusiast. Ciji Ware has written an unforgettable tale that easily brings this Duchess of Gordon to life and into your heart. This gorgeous reissue is available February 1, 2010!! Visit the awesome Interview with the author on my blog with some interesting photos. of course a giveaway is included.